First let’s talk about power estimates. If you do nothing to affect the power situation on your property in El Dorado Hills, do you predict your expenses will go down over the next few years, or even decades? Certainly, you expect to pay considerably more for your power ten to twenty years from now. So when you invest in photovoltaic panels immediately, you begin saving money on your energy expenses the moment you turn on the power of sunlight! Another argument for photovoltaic is that we live in one of the brightest states in the Union. 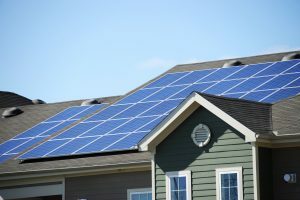 And if you look at the statistics for California and El Dorado Hills, even during the winter, you can rely on a number of sunny days when your photovoltaic panels continue to generate electricity. And that location regularity is remarkable, not just for your bottom line, but also for the earth. The less power you use from the grid, the less carbon that your needs put into the atmosphere. So photovoltaic power has a positive effect on the earth and it starts from the moment you turn it on. How else can Solaron make photovoltaic more affordable? Through continuing incentive programs offered by municipalities and governments! As these vary based on your specific address and power utility, talk with a Solaron sales agent today to learn about these potentially significant savings!